Tolle Lage in der Innenstadt von Pismo Beach. 50 Meter vom Strand und einen Block vom Pier mit seitlichem Blick. Dieses Haus (nicht Eigentumswohnung / Stadthaus) ist in der Innenstadt von Pismo Beach! (Es ist in Pismo State Beach oder Oceano nicht. Seien Sie vorsichtig, da einige Inserate Pismo Beach bewerben, wenn sie in Oceano sind. Gehen Sie zu allem. Spielen Sie am Strand und kommen Sie nach Hause, um die Toilette zu benutzen. 3 Schlafzimmer, 2 Bäder mit Meerblick. Das Haus ist für 6 Personen und unsere maximale Belegung beträgt 8 Personen. California Vacation Rentals besitzt auch das Haus nebenan, das ebenfalls 4 Schlafzimmer / 3 hat. 5 Badehaus mit herrlicher Aussicht VRBO # 127874 und 6-Zimmer-Haus VRBO # 87222. Das Haus ist unglaublich mit handbemalten Fliesen und Wandmalereien verziert, Granitplatte Zähler, voll ausgestattete Küchen, 46 'Samsung HDTV mit DVR und DVD, und eine Garage. Dies ist ein Haus, nicht eine kleine Wohnung. Die Zimmer haben einen König, Dame, und die Königin. Wir verwenden Peacock Alley Laken und Decken, die nach jedem Aufenthalt professionell reinigen sind. Die Lage ist perfekt, wie man einen Block von der Anlegestelle und der Innenstadt sind. Location, Location, Location !!! Bitte achten Sie darauf, in Pismo Beach mieten. Viele Häuser in diesem Abschnitt werden beworben als in Pismo Beach zu sein, aber sie sind tatsächlich in Oceano oder Pismo Beach State Beach. 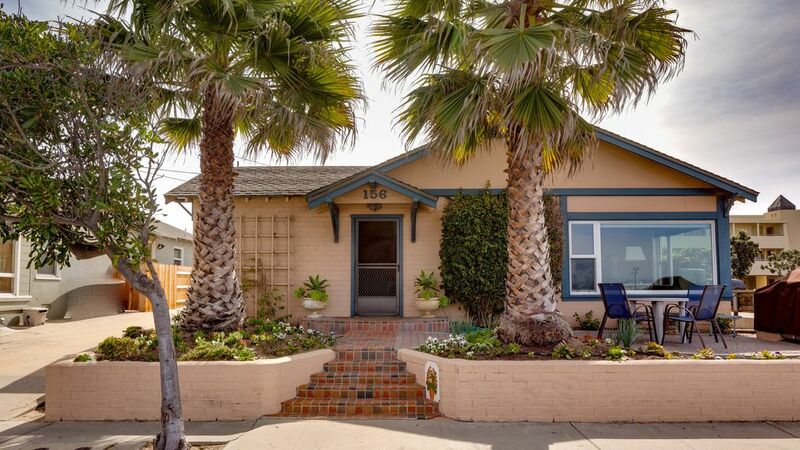 Dieses Haus liegt in der Innenstadt von Pismo Beach. Seit 1999 sind wir mit VRBO gewesen. Great Stay! Perfect CLEAN house by the pier! We loved our vacation in this home. The highlight was BBQing on the front patio. Our group rented both homes, but enjoyed the patio of this house house the most. Our group appreciated never using the public toilets in town:) It was so easy to walk back to the house. The beds were comfortable and the sheets and duvets were white, so felt and looked extra clean. It is the one thing I don't love about vacation rentals, wondering if the bedspreads have been laundered. Pismo Beach was super packed since it was Spring Break. We loved having parking AND never having to use our car in the stopped traffic throughout town. Thanks for sharing this great home with us! We met our son and daughter-in-law with our two grandchildren for a weekend getaway - It was perfect! The location great and steps from the beach, close to coffee shops, the pier and restaurants. The kitchen is spacious and open to the dining/living room. The home was clean and the beds were comfortable. This is a very clean and well maintained home. Even though it was close to a hotel it was very quiet. The queen mattress in the master bedroom was too soft for me but my husband thought it was fine. The location near the beach was great especially for our 5 year old granddaughter. It was nice being close to downtown. We parked our car and walked to stores and restaurants. We have always loved staying at the house!! We have rented both of the houses at this location on and off for over 20 years. They are always well stocked, clean, and conveniently located to the beach, pier, and downtown Pismo Beach. It was a great place to share a "Pismo Stay" with company visiting from Orlando, Florida. The only disappointment we had with this year's trip was the new hotel construction going on right across the street. The noise of trucks arriving started at 6:00 AM and was followed by the workers arriving at 7:00 AM. We're really going to miss the view all the way to the pier when the hotel construction is finished, and are concerned about the impact on traffic because the entrance to the hotel will be right across the street from the house. In spite of this year's experience with noise, we love this house and feel right at home every time we've stayed there. So, we will definitely continue to rent this property whenever we plan on an extended stay in Pismo Beach. We rented both this house and #127874 to accomodate 14 of us (7 couples) for 4 nights/weekend getaway. See reviews of #127874 as well. This house was smaller as has 3 bedrooms/2 baths but perfect location. Some upgrading is needed with dishwasher and some wiping down of cabinets, etc. but overall great for the group. We took turns cooking in both houses and could fit all 14 of us in either with no problem while dining. Such a perfect location (except for hotels coming up around it) if love the ocean as much as I do.